Huami has recently announced international availability of its new sports-watch. Dubbed Amazfit Stratos, it comes with built-in GPS, advanced performance metrics and support for more than a dozen different sports. The second generation timepiece is an updated version of the company’s Amazfit Pace sport-swatch. Launched in late-2016, the inexpensive device was very impressive on the hardware front, but left a bit to be desired on the software side. The fact that it was released without a good native app was baffling to many. It meant that you were reliant on the watch itself to review much of the fitness data. 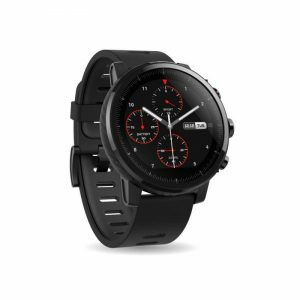 Huami is back for round two with Amazfit Stratos. For this year’s version the company has teamed up with Firstbeat for advanced workout metrics and Zepp Labs for real-time sports analytics. The promise is you’ll get detailed data typically only available on high-end devices, but at a price that won’t break the bank. I’ve been wearing Amazfit Stratos for the past couple of weeks. Here is what I made of it. Amazfit Stratos arrives in an Applesque box containing the device itself alongside a 22mm quick-release silicone strap. You also get a charging dock with 4 magnetic pins and a little instruction booklet. The overall look and feel of the watch is completely different to the Amazfit Pace. The watch is still round, but it now comes in a rugged carbon fiber design case, featuring a polished ceramic bezel combined with other water-resistant materials to provide the lightest weight possible. There is clearly a lot to like when it comes to aesthetics. The timepiece is eye-catching and has a much more premium feel than its predecessor. In fact it reminds very much of the Garmin Forerunner 935, only slightly thicker. This is a watch you can proudly wear around the clock, whether you are sweating it out in the gym or at a formal business function. In terms of actual dimensions, the wearable is 46mm in diameter and the weight including the band is a surprisingly light 70 grams. The timepiece comes with a 1.34 inch scratch-resistant 2.5D Gorilla Glass-covered transflective display that looks like it can take a lot of beating. The resolution is 320 x 300 pixels. The display is surrounded by a Zirconia ceramic bezel and reflects incident light so is always on. The device has a light sensor at the front which helps the screen to maintain proper brightness. Readability is decent even outdoors in sunny conditions, although viewing does deteriorate at some angles. Also, I did find it difficult to read the text on some of the screens, but this was due to the size of the fonts rather than display quality. You can choose to leave the backlight off to save battery life, but in this case readability will deteriorate. Although it resembles Wear OS, the watch runs on its own proprietary software platform. While this means you won’t get a ton of apps, there is lots to play around with including a choice of watch faces. Navigation through the various screens is a combination of pressing the three stainless steel physical buttons on the side and tapping or swiping the screen. To start off you’ll need to press the top right button to unlock the screen. While this is a tad annoying, it does prevent accidentally triggering a function. Then its a matter of pressing the physical buttons to scroll up or down through the various functions, or swiping the screens left and right. Further taps will take you to secondary screens with more detailed info and options, and a left swipe of the screen brings you back. You can also set the middle button to automatically launch a pre-defined workout session saving you some time. In the end, you’ll find that using the touchscreen to navigate is probably the easiest way to get around. At first its tough to get a sense of how you’re supposed to navigate. After a couple of days it becomes totally natural. Under the hood, Amazfit Stratos takes the built-in GPS + GLONASS, continuous heart rate tracking, on board storage for music, triaxial acceleration sensor, gyro, geomagnetic sensor and barometric pressure sensor from the previous device and upgrades it with some new features. Now you get a faster 1.2 GHz dual core processor, 512 MB of RAM, 4 GB of storage (of which 2 GB is usable) and better heart-rate tracking. Connection happens over low-energy Bluetooth 4.0 or Wi-Fi. Another improvement is the water resistance. Stratos is H2O friendly down to a depth of 50 meters, which is a huge improvement over the IP68 splash-proof rating of its predecessor. It will track you swim sessions, too, along with around a dozen other sports. Battery life is pretty much unchanged, an impressive feat considering the bump in specs. The 280 mAh Li-Po battery has enough juice to keep going for 5 days on a single charge, and 35 hours with GPS switched on. I certainly found this to be the case in my testing and just opted for an occasional top-up. Considering the device has an always-on screen battery life is pretty decent. This is a feature-packed device and going through everything this watch offers would simply take too long. So I will provide just a broad brush of what you can expect. Unsurprisingly, you’ll have no problems extracting 24/7 activity tracking basics from Stratos. During the day, the watch will keep tabs on steps, distance, calories, workout sessions, floors and heart rate. At night it will break your sleep session into light sleep, deep sleep and awake time. You’ll also get your resting heart rate in the morning. Most of this data is viewable on the watch-face, with more details provided in the smartphone app. I recently tested Amazfit Bip and it uses the MiFit app. Interestingly, Stratos comes with its own iOS/Android app. I am not sure why Huami opted for this. Perhaps its because the sports-watch offers so much more functionality than the company’s other devices, it was easier to create a new app than adopt the old one. If you prefer, you also have the option to link Stratos up with your Strava account. After the initial setup procedure which requires you to scan the QR code from the watch face, install the latest firmware update and register your basic details, you are good to go. I found Bluetooth pairing to be instant and automatic, so no problems there. Eventually, you’ll find that the sync process is fairly slow and can take a good 30 seconds to 1 minute. The app’s default screen is an overview of the day’s activity. Tapping on pretty much any metric will take you through to a more detailed overview, but without cluttering you with statistics. Other screens group your data by day, week and month. Along the bottom are tabs that allow you to cycle between activity stats, sports and profile. Depending on which of these you choose, you can view your daily summary, delve deep into your workout session stats, customize watch faces and play with other settings . Navigation is intuitive but I couldn’t help but get the impression that more time was spent designing the device itself, and the app was an afterthought. Nevertheless, the software does the job in providing you with all the info, even if it is slightly on the basic side. While the device does not have full auto recognition for sports, it does monitor for sustained periods of movement. So in addition to dishing out sedentary reminders, it will group your daily movements and label them as “move”, “fast walk”, etc. Amazfit Stratos does not disappoint when it comes to the quality of data. Throughout my testing, I wore the Garmin Forerunner 935 on my left wrist, and Stratos on my right wrist. Apart from sleep data and floors climbed most of the other stats were pretty much in sync. In terms of resting heart rate, Amazfit’s device had me consistently about 4-5 beats above the Forerunner, but this may be due to the difference in how the two calculate its value. The watch really comes into its own, though, when tracking sports. It has support for running, walking, cycling, swimming, elliptical machine, mountaineering, trail running, triathlon, tennis, soccer and skiing. This is an impressive list that might give the likes of Garmin and Polar something to think about. Huami says more sports will be added through subsequent software updates and I have no reason not to belive them. Tracking each sport is custom suited to the activity. Take tennis, for example. Start a session on your watch and the device will keep track of your forehands, backhands, serves, heart rate and calories burned. Integrating technology from partners such as Zepp is a clever move. While Zepp produces its own sensors for sports which dish out much more detailed metrics, Stratos taps into their algorithms to provide the basics. So for tennis, you will not get detailed stats as you would if your were to buy Zepp’s tennis sensor. What you’ll get is more for the purpose of keeping track of your activities and making sure you get credit for your workouts rather than delving deep into your statistics to improve your game. I was particularly impressed with the quality of running stats. Acquiring the GPS signal is quick and easy and the watch and smartphone app provide a wealth of info. This includes pace, calories burned, speed, step frequency, average heart rate, heart rate zones, total steps, stride, elevation and more. The app provides a great job in charting most off these and you will enjoy sifting through the data after your run. The watch will allow you to export your data, too. I logged three runs and found the heart rate to be within a couple of beats between the Amazfit Stratos and Forerunner. Below is an example of one of my runs. As you can see the two are very much in sync. GPS distance tracking is off slightly with Stratos consistently showing about a 30-50 meter deficit for every kilometer. But seeing that I live in central London there can be distortion with the signal at times. Huami has definitely made the right move by choosing to partner with Firstbeat. This collaboration brings a wealth of detailed performance metrics to the watch including: maximum oxygen consumption (VO2max), Recovery Time Advisor and Training Load. You’ll also get your Real-Time Performance Condition, a very useful metric that lets you monitor the onset of fatigue and assess the impact it has on your performance as it builds. Then there are some Firstbeat metrics you will not find on many other devices. One of these is Real-Time Coaching that ensures that any type of workout is performed in a way that is safe, effective and keeps you fit. What you essentially get is feedback in the form of prompts such as ‘speed up,’ ‘keep this pace,’ and slow down’ to ensure you reach your target effectively. The other is Personalized Cardio Training Plans. This provides you with a personalized exercise prescription based on whether your are interested in maintaining your current fitness level or improving it. You also get to select the degree of ambition with which you will tackle your goal and the type physical activity. These training tools will be of particular interest to avid runners and athletes aspiring to improve performance. The watch will also do its thing in the pool. The stats are not as detailed as for running but you do get the pace, strokes, laps, type of stroke, number of strokes, SWOLF and more. The watch display can be a bit difficult to navigate in the pool but you’ll find that the physical buttons on the side are your friend, much more-so than the touchscreen. As you would expect the sports-watch offers some non-fitness functions as well. This includes notifications for calls, messages, calendar alerts, emails and other apps. You’ll also get direct access to live weather forecasts, stop watch functionality, compass, alarm and find my phone functionality. For a true phone-free exercise experience, there is on-board storage for music. You will need a set of wireless bluetooth headphones in order to initiate playback. Music transfer is done by plugging the charger into your computer and nesting the watch in its cradle. With the right software, the watch will appear as a drive on your computer. Than simply drag MP3 files into the music folder on the watch. The whole process is fairly simple and I found I could quickly transfer music to the device. The company has definitely stepped up its game and now has a solid offering that might lure some customers from the likes of Garmin and Polar. Its latest timepiece offers most of the features you will find on more expensive devices of its rivals, in addition to some new ones. Even more importantly, Amazfit Stratos does everything well and dishes up accurate data. There is clearly a lot to like. If I was to look for negatives I would flag up the navigation on the watch which takes some getting used to. And while the screen is always-on, viewing does deteriorate at some angles. Finally, the app does a decent job, but it definitely has room for improvement. All things considered Amazfit Stratos is an ambitious wearable that offers excellent value for money. You’ll struggle to find a sports-watch that provides so much for the price. Put simply, the device packs a punch, but without breaking the bank. Is Fitbit eyeing the kids fitness tracker market? ​This is my first week using Amazfit Stratos for swimming and unfortunately my experience is really bad. It is cristal clear when designing the watch faces to be displayed for swimming none swimmer was involved on the decission. Watch displays several data on the corners using small numbers that are almost imposible to see while swimming. While simming most important information are length and distance but that info must me displayed on the center of the watch using large numbers. This info usually are read while turning but with small figures is imposible. I have even tried to read it stopping but when swimming swimming glasses have fog, drops of water and so for so you also need large figures not small ones. Even if you remove swimming glasses from your eyes you can have problems because if you use small glasses due to the pressure over eyes you can have blurred sight. Garmin and other brands displays data while swimming with very large numbers. Hi – the small fonts were an issue for me as well when running. I did not play around with the settings – but perhaps there is a way to reduce the number of data fields – Garmin has the option where you can customize the display screens. Worth looking into. My impression is that the watch was mostly designed for runners – less for swimmers. Can you tell a bit about the swimming metrics? Can more detailed values then overall swimming time and workout date be exported/synced to some service outside the app (like time per lap, swim styles etc)? As i like to analyse sports/swims with golden cheetah all these closed solutions most of the trackers use are not for me. Are you able to track gear, similar to Garmin Connect? I need to be able to track miles on running shoes. Are you able to track Stroke Count (the number of strokes you take to cover a length of the pool)? Yes – check the app snapshots above.